Piqué quilted fabrics are used to make thick, heavy, protective tablecloths. 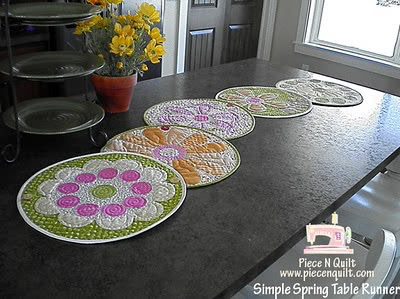 They are ideal to cover card tables, for bridge tablecloths, to protect antique tables.... 24/11/2009 · Take any medallion quilt pattern and just make the center medallion part. Or take any block that 'reads' as a circle (e.g., sister's choice, love in a mist, crown of thorns, or almost any star block) and make it either giant sized for a single block tablecloth, or make a ring of them like a wreath in a more normal size. How to create the perfect tablecloth. Customised tablecloths are a simple way to change the look of a room without spending too much time or money. These easy projects make good home sewing sense. Because most tablecloths are wider than one fabric width, you must seam fabric widths together to make the tablecloth the width you need. Avoid a center seam by using a full fabric width in the how to put an image into google search Make It In Minutes Sew a patchwork tablecloth with these simple step-by-step instructions from Country Homes & Interiors Sew together your favourite fabrics to create this stylish patchwork tablecloth. Ok, next put your tablecloth on your table all centered and such and pull the corners out into a triangle, like the picture above. Then, just cut the triangles off with a pair of scissors leaving yourself a little wiggle room to sew a seam. how to make a tshirt quilt youtube The blue and red in this quilt evoke the vintage feel, but any color combo will be stunning in this lovely pattern. 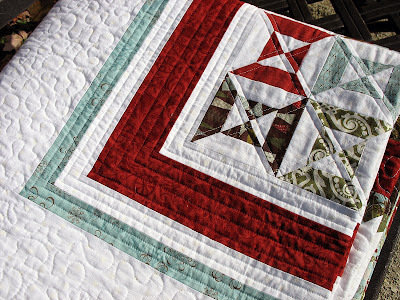 The center of the quilt, by designer Cyndi Walker, is made up of two sizes of Sawtooth Star blocks mixed with four-patches. Make this festive Summer Treats Quilted Tablecloth in time for your next Fourth of July celebration or summer family picnic. The tablecloth features variations on our Watermelon quilt block and would be charming on a picnic table or spread on the grass. The tablecloth was finished the same way as my Tetris picnic blanket. I used some very thin white (possibly lining) fabric that my mum gave me for the backing (I think this is the third time I've used some backing fabric from my mum!